A view of the sun in ultraviolet light, captured by the STERO-A probe. As NASA plans to send humans to Mars in the 2030s, work is underway to study how the space weather environment will impact their journey. Explosive "storms" that erupt from the surface of the sun regularly create showers of harmful radiation. Part of NASA's plan for a trip to the Red Planet will have to include space weather forecasting, monitoring and safety measures. A coronal mass ejection erupts from the sun, sending powerful particles toward the STEREO probe on July 23, 2012. Humans traveling beyond the protection of Earth's atmosphere and magnetic field risk radiation-caused cancers and other diseases. See how space radiation threatens astronauts in this full infographic. Space weather, also known as solar weather, refers to the light, energy and particles that stream off of the sun. The so-called solar wind is a constant stream of particles that stretches all the way beyond Pluto, creating an envelope around the solar system. The sun also releases sporadic, intense bursts of light (solar flares) and eruptions of charged particles (coronal mass ejections, or CMEs). When these particles strike Earth's magnetic field, they can create the natural light show known as the auroras. The particles released by the sun are a type of radiation, and can cause physical harm to humans. People on Earth are protected by Earth's atmosphere and its magnetic field, but without proper shielding, astronauts are exposed to these harsh weather events. "We have a plan that looks at all of the risks of going to Mars, and a big part of it is environmental modeling, monitoring and prediction of solar flares and solar events," Grunsfeld said. "It's not quite as advanced as terrestrial weather [monitoring] now, where we can see a hurricane and try to predict its path and see where it will go. The sun is much more complicated, so there's a lot of knowledge that we still need to gain." This artist's illustration show the position of the twin STEREO satellites and a solar eruption. It can take a CME many hours or days to reach Earth, so it is possible for satellites to go into "safe mode" during these events. This safe mode protects them from damage, as long as a warning system is in place. 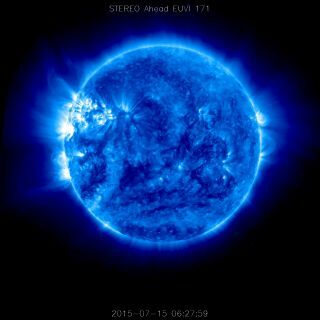 Just as local weather forecasts can alert people to hazards that may affect their day, solar weather forecasts and announcements could become increasingly relevant to people on the ground as well as people in space, according to Tamitha Skov, a research scientist for The Aerospace Corporation. Skov, who spoke at the event, is also a "space weather broadcaster" who creates videos that provide a picture of current space weather. Back on Earth, the forecasts could be just as valuable. In 1986, a massive solar storm hit the Earth and caused a power outage for 6 million people for 9 hours. In addition, Skov said, there were major problems for satellites, leading to the loss of weather satellite images for hours and a shutdown of the Toronto stock market. The Space Shuttle Discovery's fuel sensor also failed, Skov said.